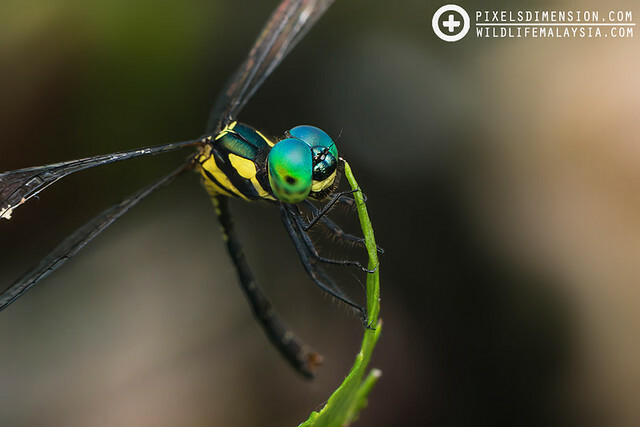 Dragonflies are amongst some of the insects that roamed the lands of Earth during prehistoric times, and they have not really changed much over these millions of years albeit some minor size decrease. 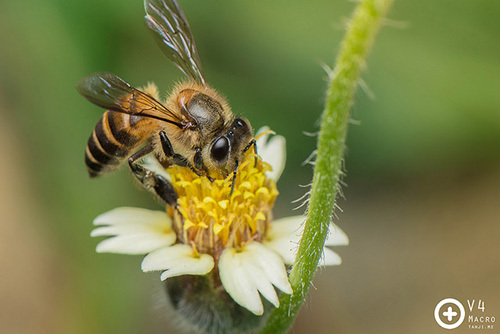 These ferocious predators can generally be differentiated from other insects based on their relatively large body size, the presence of two large compound eyes that touches one another at the top, two pairs of powerful wings and a very long abdomen or tail. Dragonflies usually keep their wings open when perched in a resting position. Well, enough talk! Please enjoy the photos! #1. 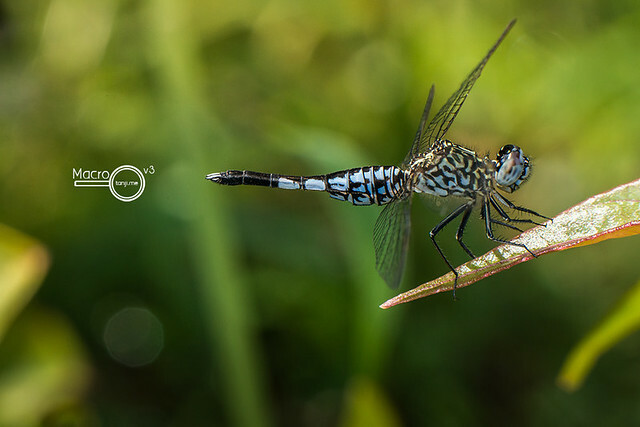 A beautiful male Trumpet Tail Dragonfly (Acisoma panorpoides) perching on a leaf. Most dragonflies are diurnal and love to stay out in the sun to keep their body temperatures high. #2. 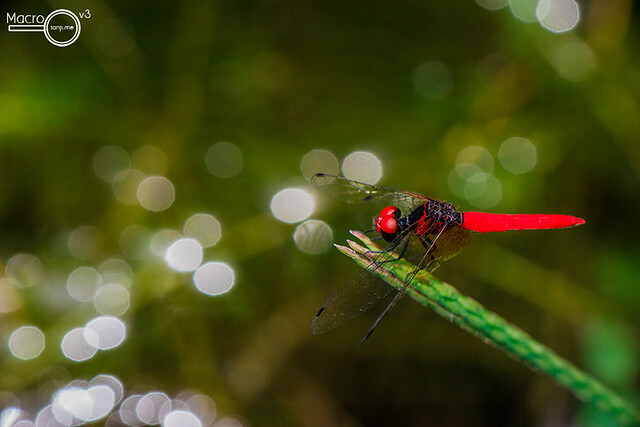 An immature Crimson Dropwing (Trithemis aurora). 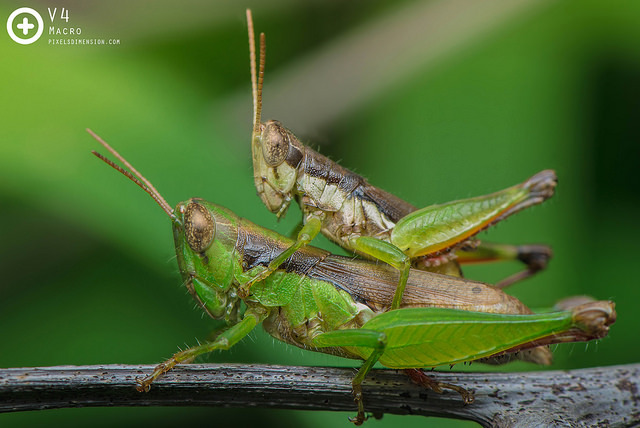 Immature dragonflies may look very different than their adult version. This particular one will turn into luminous red after the ultimate moult. 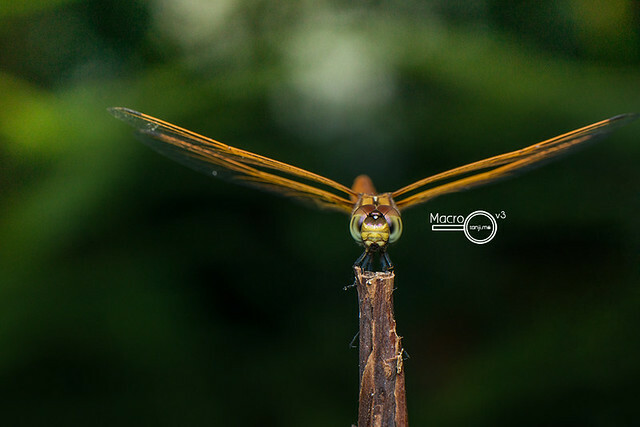 Dragonflies often perch like this as they guard their territory and female from intruding males. #3. A striking male Indigo Dropwing (Trithemis festiva). 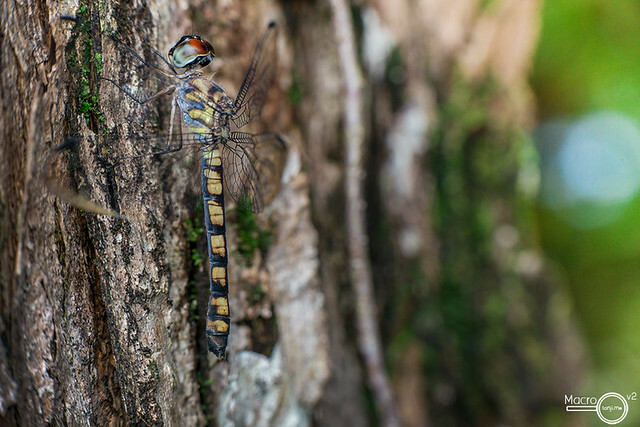 Most male dragonflies are territorial and will often perch on the same spot, guarding its spot. This makes them good subjects for photography since they almost always return to the original spot. #4. 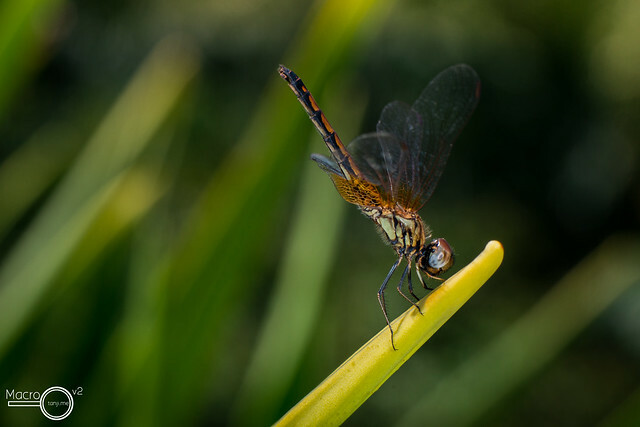 A female Crimson Dropwing (Trithemis aurora) perching. Dragonflies enjoy the heat from the sun, but at the same time they do not want to be scorched, thus many will raise their tails when it is hottest (usually afternoon) to reduce the total amount of surface exposed to the sun- smart! #5. 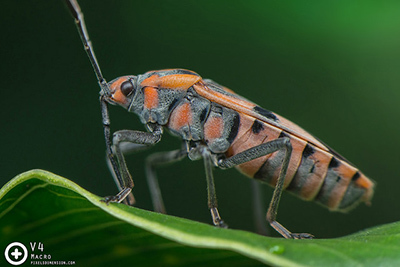 A female Treehugger (Tyriobapta torrida). Not all dragonflies prefer to perch on branches and leaves. 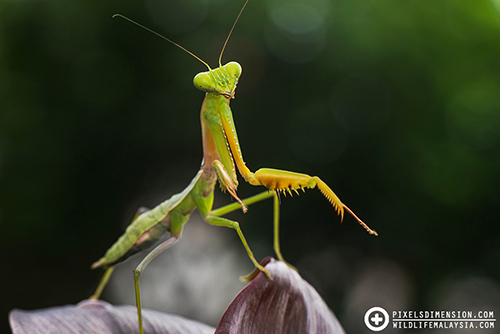 Treehuggers, as the name suggests, prefer to hang around tree trunks. This particular species of dragonflies can be easily recognized and are found in shaded areas near swamps or streams. #6. A male Scarley Pygmy (Nannophya pygmaea), one of the smallest dragonflies in the world. Measuring at about 1-2cm, these tiny dragonflies can be easily overlooked. Young males are yellowish in colour and eventually mature into brilliant red as seen in this photo. #7. 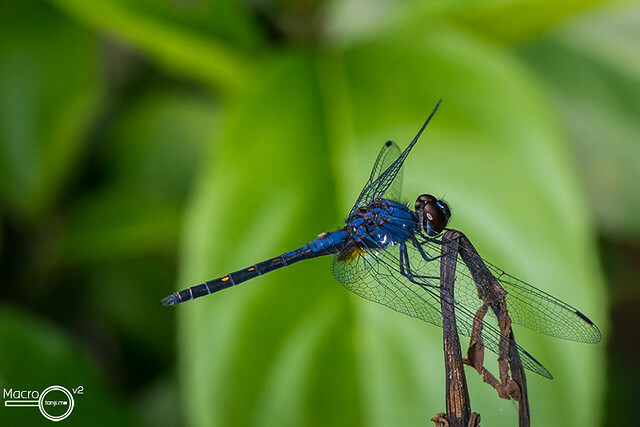 A female Greater Bluewing (Rhyothemis plutonia). 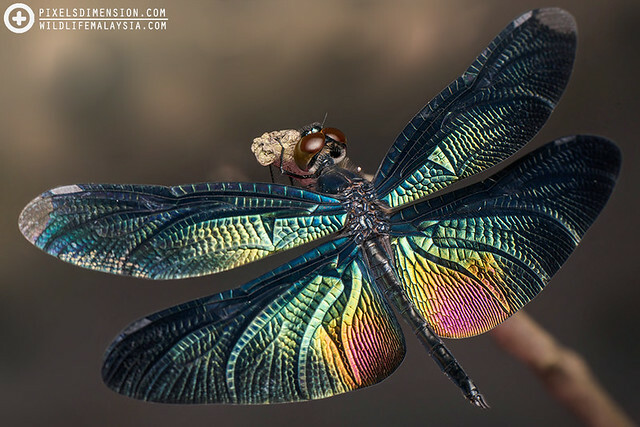 This beautiful dragonfly can be easily recognized by the purplish-green iridescence of the wings. 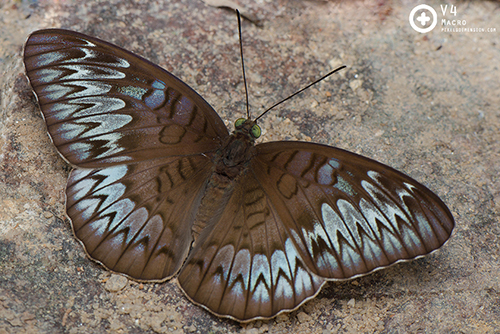 The Greater Bluewing, along with several other species are commonly known as Flutterers, referring to the way they fly in a clumsy and irregular manner. #9. An male Elf dragonfly (Tetrathemis irregularis). This relatively small dragonfly has one of the prettiest eyes ever! The eye colours and patterns will change drastically depending on your shooting angle, awesome!